The Carson property is in the North West Territories about two hours east of Yellowknife. It is 1,200 acres and contiguous to the Night Hawk Gold Corp.’s Damoti Lake gold property on its west side. Night Hawk drilled 13,000 metres in 2009/2010. The geology tends to be gold mineralization hosted in iron formations associated with sulphides. This road originates in Yellowknife and is maintained through the winter months. 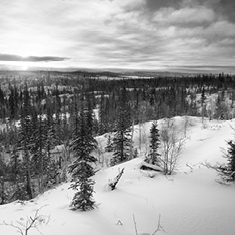 The Carson property is underlain by mafic, a lesser felsic metavolcanic and subordinate metasedimentary rocks of the Yellowknife Supergroup. Felsic metavolcanic rocks occur at the metavolcanic-metasedimentary contact. Eight major rock assemblages at the property have been delineated by historical exploration work and range from feldspar crystal tuffs, rhyolite, andesite and feldspar porphyry intrusives. Gold associated with quartz veins (shear zones) or with silicification are found in the metavolcanic and metasedimentary rocks of the Yellowknife Supergroup. The Indian Lake Supracrustal belt shear-hosted mineralized systems generally occur at or near volcano-sedimentary contacts. Specifically, mineralization on the property occurs as: gold-bearing quartz veins and lenses with pyrite-pyrrohtite and trace chalcopyrite and galena in mafic shear zones; pyrite-pyrrohtite horizons near the contact of the Lovang tuff and Snowden andesite; or as pyritic argillites associated with shear zones in the Oti rhyolite. These gold bearing shear zones occur on the property as three principal northeast-trending shear zones called the Pond, Chuck vein and Hilltop. The potential economic significance of the gold bearing formation and structures on the property is presently unknown. Previous exploration conducted in 1946 demonstrated the property holds significant gold-bearing geological structures and evidenced high grade drill results with visible gold present. Based on the recommendations provided in a Technical Report completed in November 2010 by an independent geologist, Joshua Gold Resources will embark on a restructured three phase exploration program of the property in the spring of 2012. The company expects to reconfirm findings first determined in 1946 on the originally explored Pond Zone and to conduct new exploration on the recently identified Chuck Vein. It is the independent geologist’s opinion that historical results are understated based on the technology available at the time and that actual mineralization exceeds historic reports. Joshua Gold Resources has exclusive rights to the property for 25 years.